When Hela The Goddess of Death is released from her prison, she attacks Asgard and declares herself queen. With Thor stranded and imprisoned by The Grandmaster on the distant planet of Sakaar, he must find a way to break free and return to Asgard to defeat Helena. There are now 17 films in the Marvel Cinematic Universe, and out of all these movies, the "Thor" installments have always been considered the weakest entries. Taika Waititi, director of films like "What We Do in the Shadows" and "Hunt for the Wilderpeople," has been tasked with raising the "Thor" series to new heights. And boy, does he deliver! Back to play the God of Thunder once again is Chris Hemsworth. Also returning is Tom Hiddleston as Loki, Idris Elba as Heimdall, and Mark Ruffalo as Bruce Banner/The Hulk. 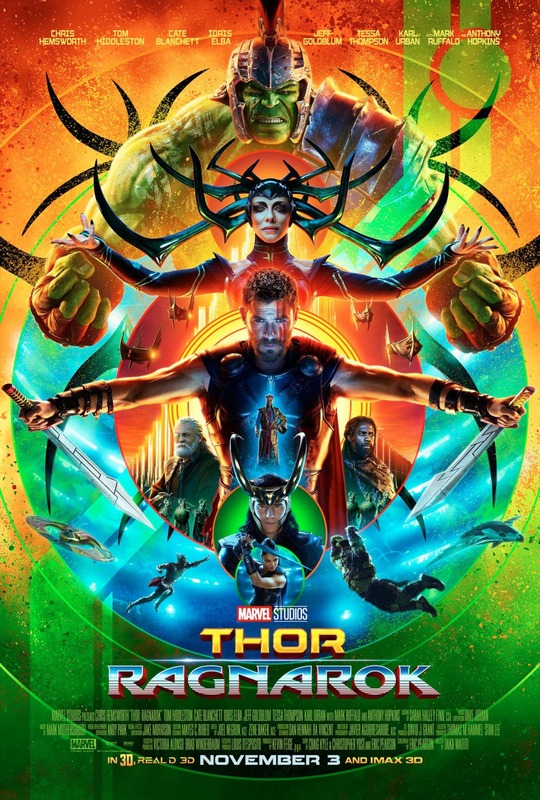 New to the franchise are Cate Blanchet as Hela (the Goddess of Death), Tessa Thompson as Valkyrie, Karl Urban as Skurge, and Jeff Goldblum as the Grandmaster, just to name a few. Hela has been released from her prison, and her first order of business is to take the throne of Asgard for herself. This is a job she quickly accomplishes, knocking Loki and Thor to the far reaches of the galaxy onto the isolated planet of Sakaar. Sakaar is trash planet run by The Grandmaster, who holds gladiatorial tournaments and intends to make Thor his latest contestant. If Thor hopes to make it home to save Asgard, he will have to fight off an old friend in the ring, escape Sakaar (which is supposedly inescapable), and defeat Hela all without his hammer Mjolnir, which Hela destroyed with great ease. Taika Waititi is a director known for his signature style of hilarious but touching comedy. His movies have tons of joviality and heart, so it is not a surprise that "Thor: Ragnarok" is a comedy-forward film. It matches closer in tone to "Guardians of the Galaxy" than it does "Thor: The Dark World," which is a good thing in our minds. This is not to say "Thor" hasn't had plenty of joking in the past as the original installment focused strongly on a comedic fish-out-of-water scenario (which people seem to forget). Either way, we laughed immensely throughout "Thor: Ragnarok" and we were thoroughly entertained throughout its runtime. That being said, the banter and jokes come at such a steady, rapid pace that the moments that should have been more emotionally impactful aren't quite as effective as they could have been. Given a chance to do comedy, Chris Hemsworth opens up an entirely new side of Thor that we have not seen before, and we really like this new and improved version of the God of Thunder. Tom Hiddleston is excellent once again as the trickster Loki. As the two brothers have evolved over a three-movie arc, now Thor has come to terms with the fact that he and Loki are extremely different and that he may never be fully able to trust him. Hiddleston and Hemsworth get some fantastic lines and scenes together, including the "get help" scene. Since Mark Ruffalo's Hulk/Bruce Banner has been noticeably absent, Marvel has found a way to incorporate the big green giant into this latest Thir flick seamlessly. Ruffalo gets to showcase himself as Hulk a little more than usual, but when he finally turns back into Bruce Banner, he gets one of the single funniest moments of slapstick in the entire picture. Now for the newcomers. Cate Blanchet is one of our favorite actresses. We never thought we would see her in a Marvel movie, but thank the gods, here she is, and she does it up right. Blanchett is fabulous as Hela, though her character is underutilized at times. Since Thor spends the majority of the film on Sakaar dealing with the Grandmaster, it feels like Hela's scenes are a bit shoehorned into the movie. However, when she is on screen, Cate Blanchett is fierce and flawless as this villainess. We would have loved to see her with the Grandmaster at some point, but c'est la vie. And speaking of the Grandmaster, Jeff Goldblum is wonderful in this role and gets to do his whole Jeff Goldblum-esque thing, which we have always found to be hilarious. His makeup, costuming, and mannerisms are quintessential Goldblum, and he also gets a lot of comedic moments as well. Finally, the best character in a movie called "Thor: Ragnarok" is not Thor at all. No, it is Tessa Thompson's portrayal of the awesome character Valkyrie. It's really refreshing to see more badass women in the group, and Thompson is remarkable in this role. With a past that has shaped her character for better and for worse, she is tough as nails, intense, and compelling. We cannot wait to see more of Thompson in the future and if Marvel knows what's good for them, they will continue expanding the Valkyrie's character arc. "Thor: Ragnarok" is a damn good time and a total blast to watch. It is colorful, vibrant, and retro, pulsating with a fantastic score and fitting soundtrack. Taika Waititi's directorial efforts are excellent. The characters come together to make one bitchin' cast. We would have liked a little more emotional pull in what are meant to be the heavier scenes, but that's our only chief complaint. The final battle is wonderful and we finally get to see Thor live up to his moniker as the God of Thunder. This is definitely a must-see for those interested in the MCU. **Did you know we have a podcast? Check out the episode where we discuss "Thor: Ragnarok" right here! Our review starts at 19:40!